This is not really a 2000trees ‘Albums of 2013’ list, it’s just my own personal selection, but given that I book the bands for both Trees and ArcTanGent I thought people would be interested to see where my tastes are coming from. Music is my ultimate passion and I have to say I really enjoyed pulling this list together, particularly the idea that I might influence someone to go and check out a band they’ve never heard of. So instead of reading any more of my waffling please click on the links below and hopefully you can discover something you’ll fall in love with. Do you agree with my selections? Do you have a favourite album yourself? Why not share your views on our facebook page. James Scarlett is one of the founders of both 2000trees and ArcTanGent Festivals. In case you haven’t heard, 2000trees has won a national award! Our man Andy explains how it feels to win the coveted Grass Roots Festival gong and why we are looking forward to 2014 so much. In other news, our Xmas Ticket Special Sale is almost over with £5 off 2013 prices – you’ll never see the like again so why not buy yours here. Plus check in regularly for the next blog instalment and let us know your thoughts for next year’s ‘Trees’ on facebook and Twitter. 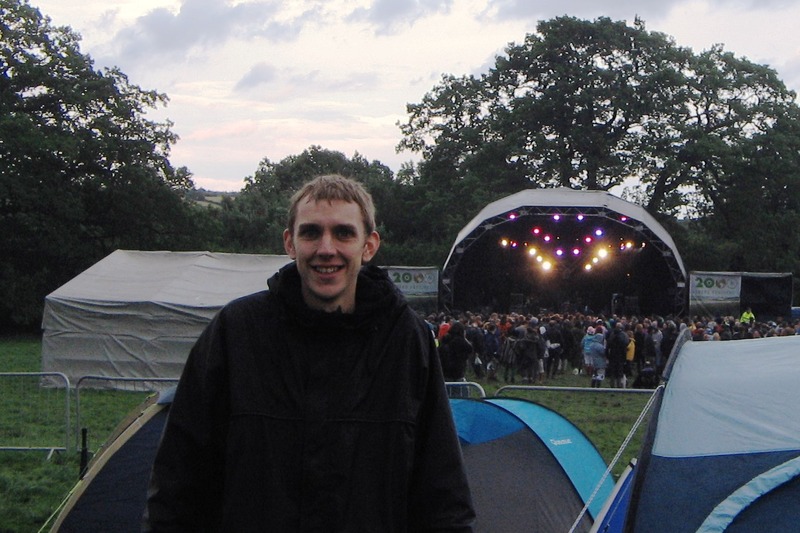 And the Grass Roots Festival Award 2013 goes to… 2000trees! It was quite a start to the week for 2000trees and my hangover on Tuesday was testament to how much it meant. We partied hard after hearing we’d won the Grass Roots Festival Award, handed over by comedian Phil Jupitus at Camden’s Roundhouse recently. We were shocked, genuinely, and as a result the free bottle of vodka we received alongside our trophy lasted very little time as we shared it among friends. In short, we celebrated! Though you may not realise it, dear reader, the award was your way of saying thanks to us for organising 2000trees. You see, the voting was done by you, our amazing fans, which means you thought us worthy of this accolade and voted in your droves (500,000 people voted across the UK this year). The fact that you made it happen is sincerely the best bit about winning. Thank-you. We are over the moon to win a national award. I’ve done a couple of media interviews and they are already asking how we can top this triumph next year. Plus Rob, Si and I were asked to do a video interview straight after getting up on stage to collect the award, I would love to see the tape! We started with a blank sheet of paper and a commitment to always look at it from the point of view of a festival fan first. We have remained true to that goal and are driven ever harder to succeed with that vision, due to the loyal and at times overwhelming support of you, our festival ‘family’ of dedicated fans, who arrive each year come rain or shine. You share our journey both at the event and with social media conversations, likes, shares and comments throughout the year, brightening up the 11 months we’re not in a field at Upcote Farm. And so you share this award with us – the icing on the cake of a good year for the festival. People have often asked me whether we ever thought we would get this far and honestly, we didn’t even know if we would do a second one because the first was so tough. But we did, we love doing it and we will continue to do so, as long as we get the support of festival-goers who share our vision that small is beautiful. But we’re always striving to develop the festival further. And one of the best ways we’ve continued to move forward each year is with a good mutual understanding with people who buy our tickets. We listen to all your ideas for new and underground British bands to book, layout improvements and interesting ideas. You guys are LEGENDS and make it all worthwhile, especially at the event itself. And that is surely the best medicine to get us all focused on making 2014 the best year yet. We have a few surprises up our sleeves for next year and we’ll have more details on these in the New Year… watch this space. Plus we’ll have to rename the secret area in the woods as many of you have now found it! There will be challenges ahead, especially in a world where corporate sponsorship helps big festivals to overwhelm you with advertising and the lion’s share of media coverage. But as fans of 2000trees you’ve already proved that you can see past all the hype. 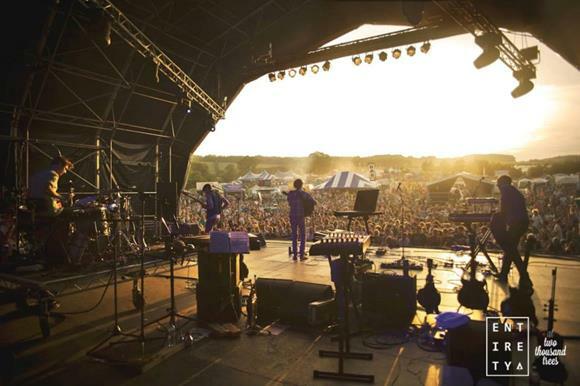 By supporting a small, independent music festival you are supporting new and underground British music, a wealth of independent traders, the Gloucestershire economy and much more. Also, I must give a shout out to our weird little sister ArcTanGent Festival, which also won an award in only their first year. Really well done guys. Finally from me, I’d like to thank all of the people who have helped us this year behind the scenes. You know who you are, we love you and we will welcome you back with open arms next year to make 2014 – our eighth event – better than ever before. So raise a glass, to enjoying the festive season and thanks to one and all. Roll on the summer! Andy Rea is one of six friends/founders of 2000trees and by day runs his own company, Redtarn PR & Events. 2000trees is not just a festival that happens in a field every July in Gloucestershire. For locals like me, once the silent disco headphones have been switched off and the last dregs of Badger’s Bottom have been poured from the kegs, we don’t just pack up our tents and forget about the festival until next year. We keep our wristbands on for months and when we see each other in the pub, we nod in recognition that we went to the best festival in the country and it took less than 20 minutes to drive there. When we go to gigs in Cheltenham we dig out our tatty old 2000trees t-shirts that have been washed a thousand times and wear them with pride (even though you can barely make out the names of bands that probably split up several years ago). When Frank Turner cancelled his headline slot in 2009, he made up for it by playing a show for next to nothing at the Cheltenham Town Hall a few weeks later, organised by the ‘trees’ team. We paid our fivers to get in and were treated to a show that in one breath said: “Sorry” and in the other: “But you know that I’ll be back at 2000trees.” And he has – many times. Watching him tear through ‘Love, Ire & Song’ in the Cave on Thursday night last year proved that 2000trees just keeps on giving you those spine-tingling moments. At the festival we often make spur of the moment decisions that lead to wonderful new discoveries. 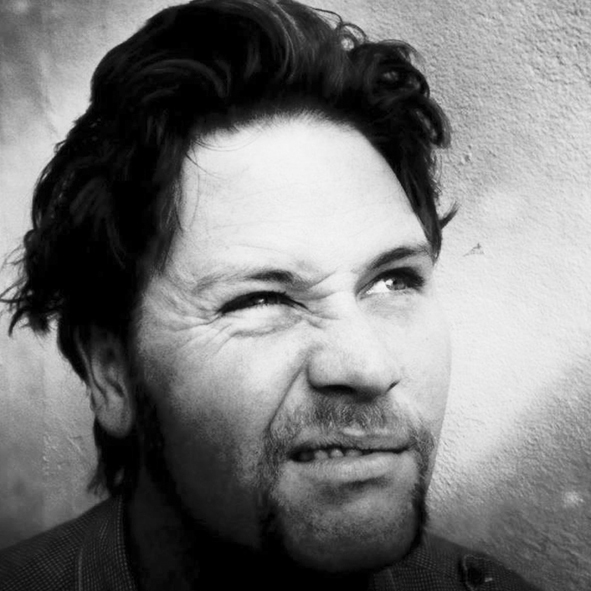 I first saw Bristol folk singer Gaz Brookfield on a soggy Saturday morning in 2011 when some people were busy scooping water out of their tents – I’ve watched him play countless times since. In seven years I’ve seen Jim Lockey & the Solemn Sun turn from a gentle, tambourine tapping folk band playing in Rise Records in Cheltenham, to a relentless touring machine ripping up the main stage. And then there have been those moments that are shared between mates in a field in the way that only happens at a small festival such as this. Like standing awestruck looking up at the stars on the way to the Greenhouse stage or being played to in a gazebo by two blokes who were wandering around with a guitar and a Cajon drum. We never did catch their names, but they knocked out a mean ‘Hit the road Jack’ as we drunkenly shouted along! I like the way I see my old school friend doing security in front of the main stage every year. I like the way Thrill Collins play in the bar when the sun has gone down. And I like the way I can bring my own beer, a cheap camping chair and pitch up within a stone’s throw of the main stage year on year. I love the fact that it only takes a few minutes to wander between stages. I love the fact that through the year we are treated to mini-festivals in Cheltenham called Trees on Fire (or some other festival related pun) where we can watch 2000trees bands past, present and future. And I love the fact that we get asked who we’d like to see on each and every stage. One year my wish came true and The Wave Pictures played in the Leaf Lounge – I watched them from the barrier and pretended that they were booked to play just for me. So, even when the nights draw in and next summer seems a long, long time away, some of the many bands that have played the festival since it started in 2007 will be playing in the Frog & Fiddle. You can say that you saw them at 2000trees first. Throughout the year we pick up flyers and look at posters in Badlands record shop with the date on. So many Friday afternoons are simultaneously booked off work for the same weekend in July that the local economy in Gloucestershire must come to a standstill when 2000trees is on! And when that weekend in July finally comes around, we pray for sunshine (but buy a new pair of wellies just in case). We bump into the same faces as we pitch our tents in the same spot we have for years, then open a can of cider and watch our mates’ bands come alive on stages in front of hundreds of people. You just don’t get that at bigger festivals. Then finally, before the headline band bashes out their last few chords on Saturday night, we make sure that we buy another t-shirt to add to our collection. After all, for those who love new and underground music and support local bands, 2000trees is for life, not just for a weekend in July. Ticket winners, new competition and date for your diary. Hope you’re all keeping warm & dry!? It’s been a while since we’ve touched your base, so we thought we’d drop you a line to let you know three important snippets of information…. First order of business: A date for your diaries! 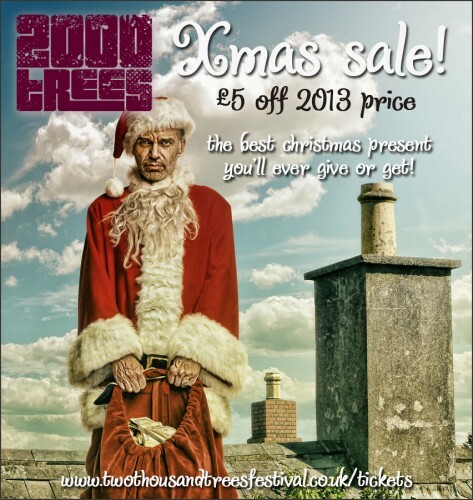 On the 9th of December at 7pm sharp, you’ll get one final chance to bag next year’s 2000trees tickets at £5 off 2013 prices! Yep that’s right, a whole weekend of fun for a bargain basement £67! These are strictly limited to 500 tickets so why not buy yourself or your loved ones something amazing for Christmas this year!? Stick it in your diaries now! 9th Dec 2013 at 7pm & invite your friends to this here Facebook Event. Link will be up on the 2000trees website/ Facebook at 7pm sharp. Do not miss out. Second order of business: Survey ticket winners! Thanks loads to everyone who completed our survey – it really does help us make changes to keep on improving your festival! We’ll let you know more details of what we’re changing at 2000trees in the new year, so stay tuned! As promised we said we’d pick 10 winners from those of you who completed the survey, who’d each bag a free ticket to next year. 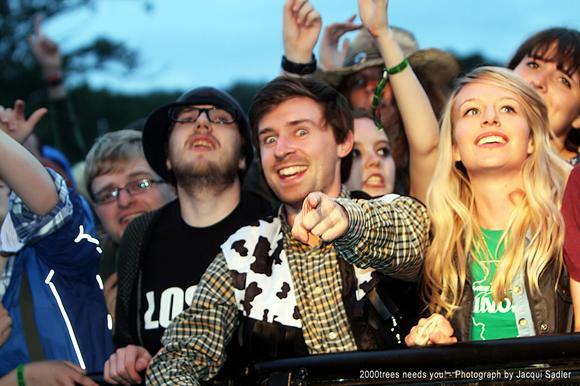 Well without further nonsense, the following lucky people have all won 2014 trees tickets including Early Entry! Whoooop! We’ll email you all separately for details of how you can claim your prize! In no particular order…. Fancy winning more tickets? Well then, blog us up! We’re about to launch an ‘Access All Areas’ blog on the website to bring you a range of voices, views and news, featuring guest contributors. The whole idea is, as the name suggests, to offer you a look behind the scenes of how 2000trees is made. We’ll update it regularly with all manner of 2000trees related things so you can watch the festival develop over the year. But hold on, WE WANT YOU to be the first guest blogger – the best 5 entries will win a ticket to next year’s festival & the best 1 will bag the blog spot! Just send a one sentence blog idea to press@twothousandtreesfestival.co.uk. We’ll pick a winner & 4 runners up and then ask the winner to write a short blog to go up in pride of place on the trees website. It could be a story of your favourite trees band, an anecdote of your favourite memory at 2000trees, a lowdown on your favourite new band or anything else you can think of – the blog is your lobster as they say! Well that’s that for now…. remember, remember the 9th of December and you could get your hands on £5 off 2014 tickets! It’s official. We’re banning the phrase ‘it always rains at trees’! What a scorcher. Just a quickie to let you know about reduced ticket prices for next year (for a limited time), our survey to WIN tickets and ArcTanGent Festival next month. 2014 tickets at £5 off! To say thanks for being such a loyal, amazing & friendly bunch, we’re giving you the chance to snap up next year’s ticket for £5 less than this year. So that’s a weekend ticket for £67. Get yours here via the 2000trees website before they all vanish and tell your friends by forwarding this email or posting it on facebook so they don’t miss out! Please continue to share your stories, photos and videos on our facebook page. We’ll give out prizes if you actually make us laugh out loud! 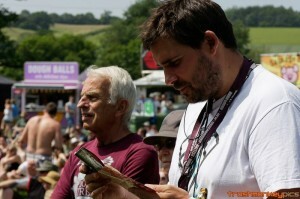 Talking about prizes… You can win tickets to next year simply by entering our short survey here. We really do value all your opinions and your answers help us make next year’s festival even hotter! We’ll put all responders into the hat and pick 10 winners at the end of August. 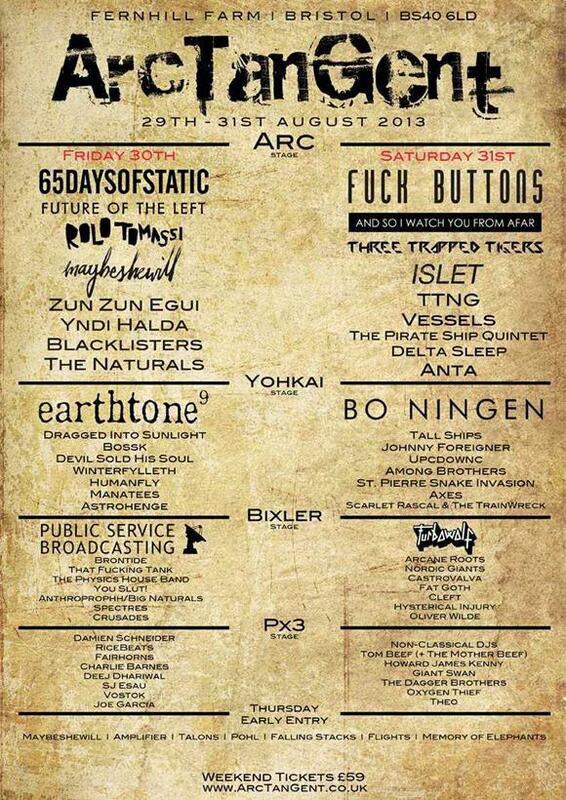 Finally, it’s the first edition of our weird little sister festival ArcTanGent next month down Bristol way. It’s happening 29th – 31st of August (the week after bank holiday) and tickets are only £59 for a whole weekend of festival fun! They’ve got some truly amazing bands (see below) and we’ll all be there in force propping up the bar. We’d love to meet you for a nice cold beer, so get your tickets here and we’ll see you there!? Have you seen the fricking weather?? Sunshine all the way baby! Well, we were owed a dry year! Looks like we’re in for a reet good do! That’s Yorkshire for “a jolly marvelous time” in case you don’t speak Yorky! Anyhoo, last email before we get sucked into the whirlwind. Just to let you know there are a few tickets left for you stragglers. Get ’em here now and come get yourself a suntan. There will be tickets available on the door and a few day tickets, but you might as well buy them in advance from the 2000trees website so you get into the site quicker! We’ve been chilling the beer for a few days now, so it should be totally icy by the time you rock up. All that’s left to say is, bring your shorts, flip flops and sun tan lotion. Oh and make sure you drink plenty of water (as well as cider), we don’t want any people going down with sunstroke! We’ll see you down the front in a couple of days. Click our amazing line up to Buy 1 of the last tickets! You’ll be pleased to know that Upcote farm has been bathing in sunshine for the last few weeks. Now the arena field is, as the Aussies say… “as dry as a dead dingo’s donger”. Because of this we’re so far ahead of schedule we may just spend the next week in a hammock sipping Mai Tais waiting for you all to turn up! The last remaining tickets are available online so tell your mates to pull their fingers out by sharing this on Facebook! 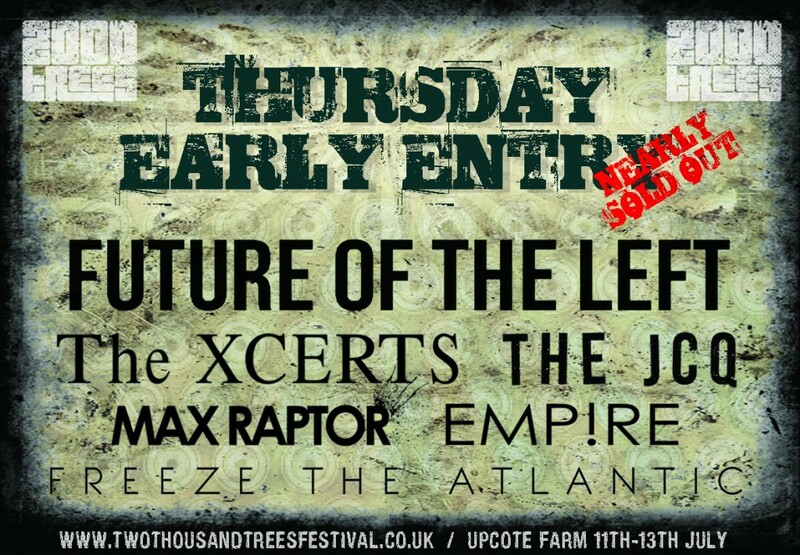 If you want to come to 2000trees we suggest you get your tickets ASAP as we really are scraping the barrel now! OPENING TIMES: – the doors open at 1pm on Thursday for Early Entry Ticket holders only. If you have a standard weekend ticket then you will not be allowed through our hallowed gates until 8am Friday. Please DON’T turn up earlier – we will not let you in! ID: – if you look under 25 and want to be served alcohol at the bar then you must bring an official form of ID (passport, photo driver’s licence, Prove It card etc). FORBIDDEN ITEMS: – as a condition of our license you cannot bring glass, fireworks or chinese lanterns onto the site. Under 18’s aren’t allowed to bring alcohol onto the site (we don’t make the law – yet). And unfortunately under 18’s with alcohol will have it confiscated. DIRECTIONS: – Click here for directions and transport information (including details of the shuttle bus from Cheltenham train station, which you can book here for £6 return). LITTER: – Our beautiful festival field for the other 362 days of the year is home to a load of sheep. They’ve told us that they don’t like to eat cigarette butts, cans or tents!!! So please put all your litter in the bins provided & take your tents home with you. Just imagine you had to eat off that ground after the festival! Recycling facilities will be available so please please please use them. Unhappy sheep = Unhappy farmers = No more festival!!! LOCKERS:– please ensure that you either leave your valuables at home or use our lockers! Unfortunately some people like the look of your valuables more than you and believe it or not tents are not that secure! Make sure you bring your sun tan lotion, this year is going to kick last year’s sorry behind! 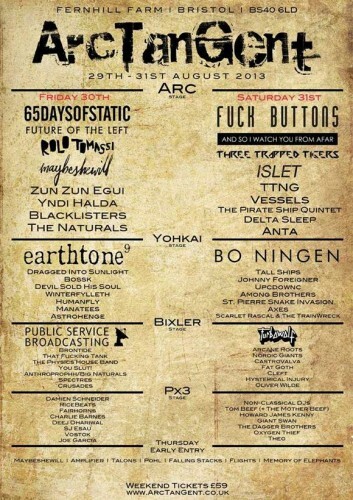 If you’ve attended 2000trees before, there’s a chance you’ve heard of Camp Reuben. If you haven’t, or if you have and had no idea what it was, it would be helpful to be acquainted with Reuben , a heavypoprocksomething three piece from Surrey who were, until they broke up about 5 years ago, one of the finest acts that the British rock scene had to offer. Here’s a youtube playlist: Go. Fill your ears, then come back. I’ll wait. In 2008, Reuben were booked to headline the second ever 2000trees festival, but for a number of reasons too lengthy to go into here, they broke up just weeks before it was due to happen. This tragic loss to the UK music scene left myself, my good friend Steph Eastty and a whole horde of other Reuben fan(atic)s with tickets to a festival we knew nothing about, purchased solely to see a band who now wouldn’t be there, and initially no one could muster much enthusiasm for attending the festival without Reuben. After some discussion however, we decided that what the hell – we’d go along anyway, on the off chance that there were some other bands worth seeing, or some hijinks to be had. We formed a plan to camp together under the (admittedly unoriginal) moniker “Camp Reuben” and together we would drink, laugh, and sing Reuben songs all night, to celebrate the band we loved rather than mourning their demise. I’d bring my guitar, Steph would make a flag – it was a fine plan, and one that came to fruition in an unexpectedly spectacular style: after the last band finished their set on the Friday night of the festival, Camp Reuben found itself playing host to a sing-along on an epic scale, as Reuben fans from all over the festival came to join the party. Amongst these was Frank Turner, who eventually ended up with the guitar, playing pretty much whichever songs we shouted at him for the best part of 2 hours. It was awesome. When we ended the night we had well over 100 people crammed into our small campsite, all of them singing their hearts out. We Want YOU! at 2000trees! Howdy peeps, hope this finds you well and the sun is shining in your part of the world?! The sunny weather this weekend has obviously got you in the mood for festival season, because we just had our best week of ticket sales since we announced Frank Turner was headlining! If you’re one of the few folks that haven’t got your 2000trees tickets yet, what are you waiting for? Just in case you need persuading we thought we’d remind you what you’re missing out on! 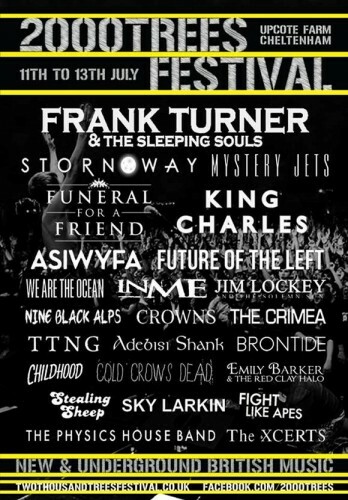 1) 2000trees is Frank Turner’s only small UK Festival this year. And as it’s his favourite UK festival, we reckon he’s gonna put on an awesome show just for you! If you love a bit of Frank, then you’ll definitely have an awesome weekend at2000trees. 2) If you want more than Frank, we’ve also got 92 other amazing bands to get excited about. Check the trees website for our full line up, which includes Mystery Jets, *King Charles, * Stornoway, * Funeral for a Friend, * Dry the River, * Future of the Left, * Adebisi Shank, * ASIWYFA, * The Xcerts, * We Are The Ocean *INME, * & Maybeshewill to name just a few! 3) It’s not all about the music, 2000trees is also about our amazing food. We’ve got the ever popular Pieminister returning for their 6th year in a row, fantastic Mexican,Chorizo, amazing Thai, mouth-watering Pulled pork, our stupidly tasty Smokery,and veggie/vegan & gluten free options from our good friends Wide Awake Cafe if you prefer your food without a face! Talking about faces, look at these beauties…. 4) Want something to wash down that gastronomic feast? Well never fear, our bar monkey has just the thing. We’ll have 3 tons(!) of Badgers Bottom for starters. As ever we’re stoked to announce that Cotswold Brewing will be providing ice cold locally hand crafted Cotswold lagers, whilst local favourites Battledown Breweryare bringing some of their finest ales including a brand new one, Natural Selection! 5) If that doesn’t get you all hot under the collar, we’re also having fancy dress (80’s movies), competitions to win tickets for next year and the word on the street is, there may even be a few secret sets from some of your favourite bands! So keep your eyes and ears peeled! Oh and 1 request we get every year, is that we don’t increase capacity… so to keep you guys happy, you’ll be pleased to know that’s exactly what we’ve done. We’ve kept the capacity the same yet again, and tickets are still strictly limited to just 4,500…. and running low! So what you waiting for? Get your tickets via the 2000trees website before some other cunning fox gets them all! 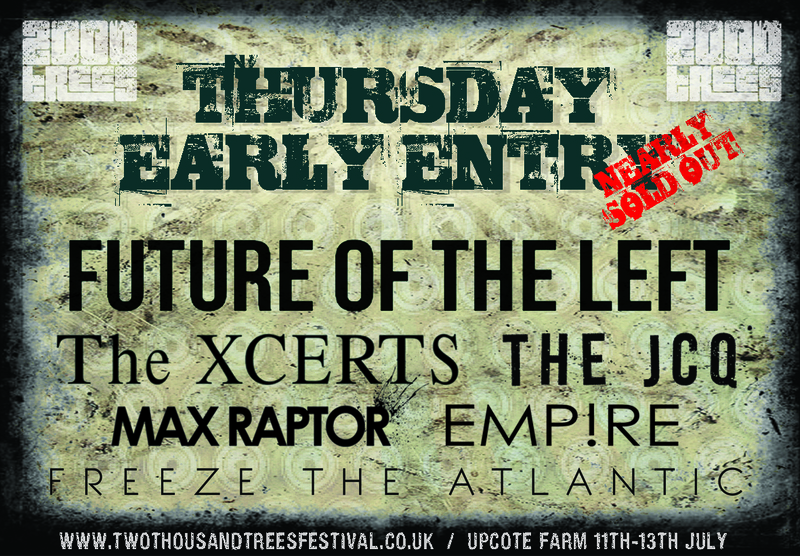 See you down the front for what’s set to be the best 2000trees yet! We also Twitter So come say hi on either or both and tell us what’s on your mind! More great news for you today… and a cheeky little competition to win tickets if you’ve not got yours yet! You’ve already heard about Xtra Mile Recordings taking over the GreenHouse stage on the Friday at Trees. Well we’re massively excited to tell you that the legends at Alcopop! will be doing the same on the Saturday. Boom! Alcopop! 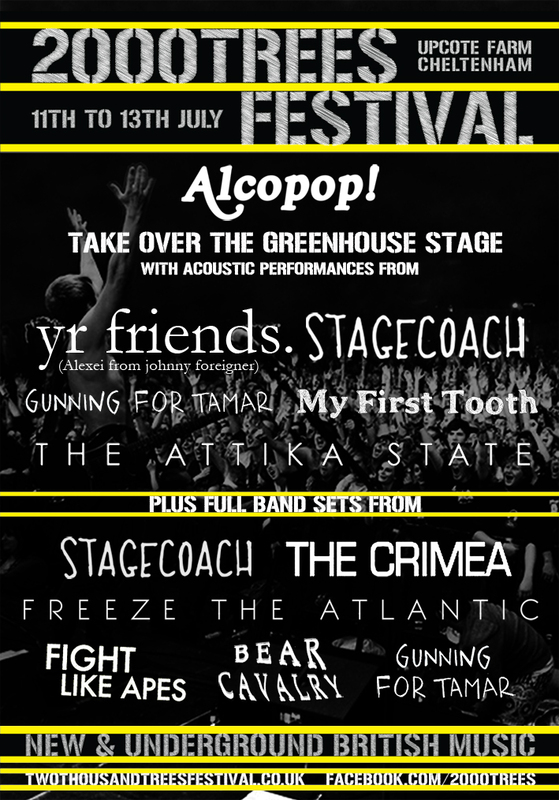 acts performing special, one off acoustic sets include; Johnny Foreigner, Stagecoach, My First Tooth, Gunning for Tamar, The Attika State and Jurassic Pop. We’re really chuffed that these bands have agreed to do this, and we think you’ll agree it gives yet another dimension to what is the best Trees line up yet! Also playing on this day are Side-step DJs, Fitz, El Morgan, Kitten & Bear and Chalk. 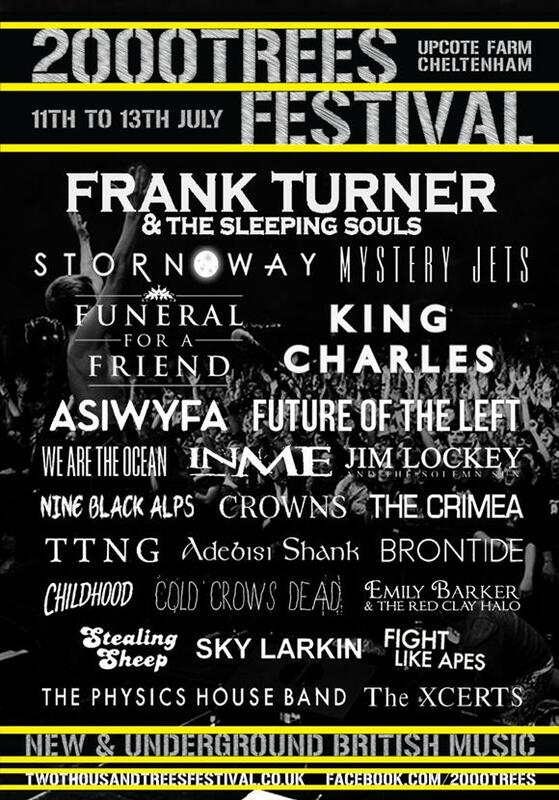 And don’t forget (as if you could), that the line up also features the amazing Frank Turner & the Sleeping Souls, Mystery Jets, Stornoway, King Charles, Funeral For a Friend, Dry the River, And So I Watch You From Afar, Maybeshewill and Future of the Left. Fancy winning a ticket to this year’s festival? ‘Course you do! Well head to our facebook page and answer the question we posted up last night… “Describe 2000trees in under 10 words to someone who’s not been before”? When we did this a couple of years ago we came up with, New & Underground British Music… But maybe you’ve got a better description!? The best 5 entries will all win their very own guest list ticket, which includes Thursday entry. This means you will get to see the extra special sets from the following bands. Future of the Left, The Xcerts, The JCQ, Max Raptor, Empire & Freeze the Atlantic. Rumour has it that there may even be an extra special guest or two sneaking into the Thursday line up somewhere…. but you didn’t hear that from me right!? There’s only 50 or so tickets left for the Thursday night and for £15 it’s a right bargain! So if you want to arrive a day early, pick the best camping spots, be the first to sample some badgers bottom AND see some extra special sets in The Cave, then get your Early Entry tickets here.